First of all, I purchased the yellow fabric at HB Fabrics here. (Alexander Henry Amelie in Yellow, Matisse Collection) And I bought the gray fabric here. (Ty Pennington, Lace Taupe) I actually purchased the thicker Decor Fabric in the grey because I knew I'd be using some of it for the canopy, and wanted it thicker. It has a nice sateen finish and is very soft. But the Ty Pennington collection also comes in the regular weight cotton. I purchased 2 yards of the yellow and 1 yard of the gray. But the amount of fabric you'll need depends on how much fabric you need for your canopy, how much of the old canopy/car seat fabrics you use, how much of each color you use on the car seat, etc. I didn't hate the color scheme/design of this car seat........but it wasn't exactly what I wanted. And even though the fabric was a bit slick, and would have wiped well, my babies tend to be sweaty and the fabric wasn't very breathable. 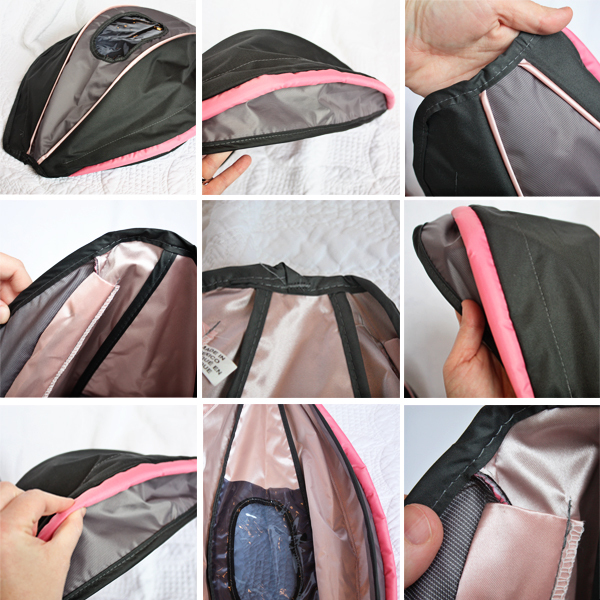 **I used the exact padding and sizing.......keeping the cover true to its fit inside of the car seat. So it is exactly the same size, fits the exact same way, and will be just as safe as the original. **You'll see that the gray piece at the bottom (where the feet would go) didn't make it to the final car seat cover. I changed my mind at the end and swapped it for the yellow fabric. If you turn this piece over, you'll see the square on the back side. I trimmed the square with pinking shears, to help avoid fraying. But you could also zig-zag the edges before attaching the square several steps ago. So I referred back to my first picture, and started putting the pieces back together. I used pins each time I put 2 pieces together, and then sewed it together........keeping things very precise. You want to put the top of the seat together by itself......and then the bottom section. Next, I took some shortcuts. I used the original fitted pieces, that keep the cover tucked into place over the car seat. The color matched perfectly and saved me some time. Perfect. But you may need to use your original pieces to cut out new ones that match your new fabric........but I just don't have pictures showing that step. .........and to the foot section of the car seat as well. Now slide your cover onto your seat.......it should fit exactly the same way your original one did. Make sure to take pictures just like you did with the car seat cover. You don't want to forget how anything looked. Then I picked all of the pieces apart, just like I did with the car seat cover above. Each section has a light pink piece of satin material on the underside that I peeled off the top piece......but didn't take a picture to show you. ..........then sewed the tubes right to the center section of the canopy (just like it was done on the original canopy), with the raw edges matched up with the outer raw edges of the center canopy strip. ........and sewed off each end with a zig-zag stitch, keeping the plastic pieces securely inside. Now, the back piece of my canopy has a casing to slide the main plastic structure of the canopy. I cut the strip for the structure just like the original, then serged the raw edge (you can zig--zag it too). .........then slid the plastic boning on in. 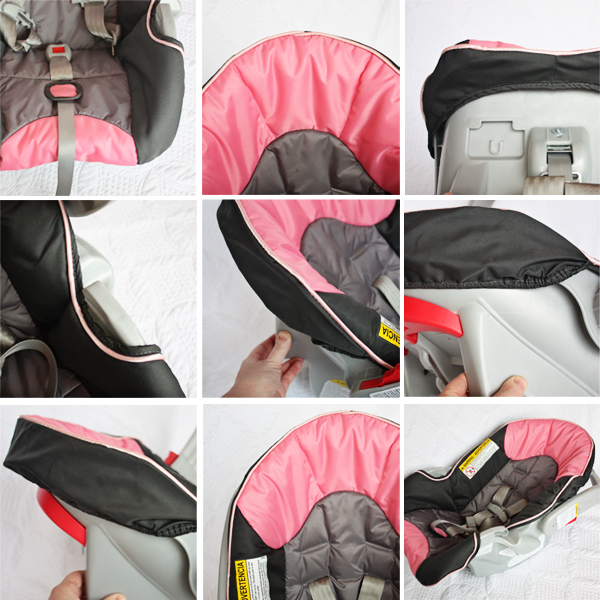 Then attach the plastic pieces to the car seat........allowing your canopy to stand up. Last step......the seat belt shoulder covers. Then, I made my own bias tape (click here for help) and attached it to the raw edges of each shoulder cover. And lastly, I attached the velcro to each strap......just like the original ones.